A costume drama is a movie genre in which costumes and sets are used to make it look like a particular time in history. 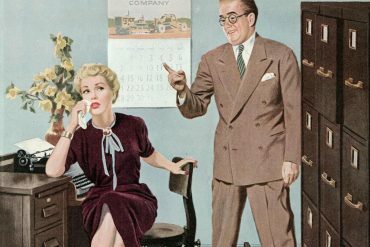 The term is generally used to describe historical movies, where clothes are important to create authenticity around the time period in question. 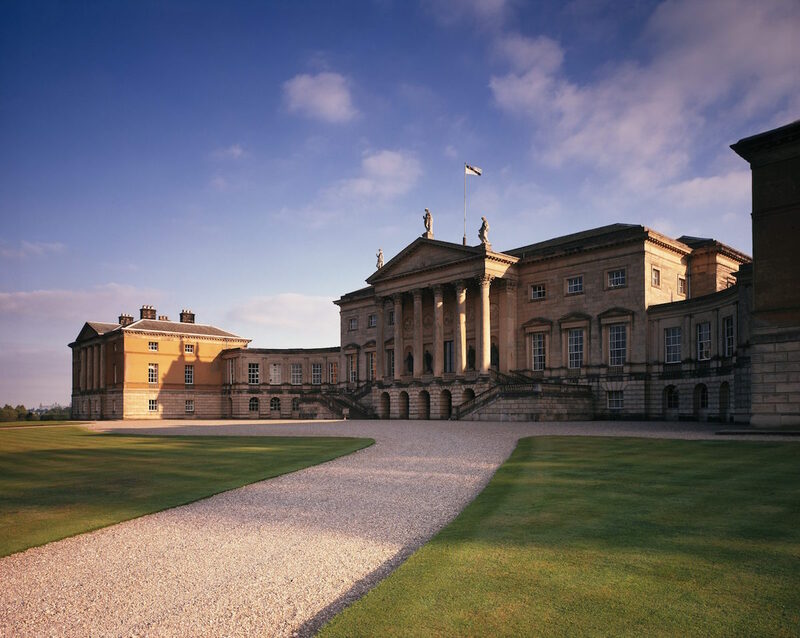 It’s only fitting that Britain, the home of among others Jane Austen and the Bronte sisters has also been used as the settings of some of the most lavish and beloved costume dramas ever filmed. 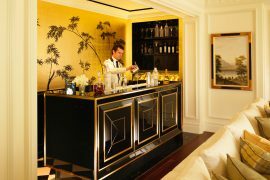 In addition to the clothes, the location and its surroundings are of great importance for the experience around costume dramas. There are many time periods represented in British costume dramas, but in many of the movies the castles have an important role for the atmosphere. It’s not just Mr Darcy that Elizabeth Bennet falls in love with – it’s his grand estate, Pemberley, too. In Pride & Prejudice (2005), Chatsworth in Derbyshire, central England, masqueraded as Pemberley. This was appropriate, as it’s believed Jane Austen may have based her description of the fictional house on Chatsworth. In the film, Lizzie (Keira Knightly) can be seen wandering through its Painted Hall and Sculpture Gallery, where she sees a bust of Darcy (Matthew Macfayden). Chatsworth was able to keep the bust as a memento of the filming – see it for yourself in the Orangery shop. 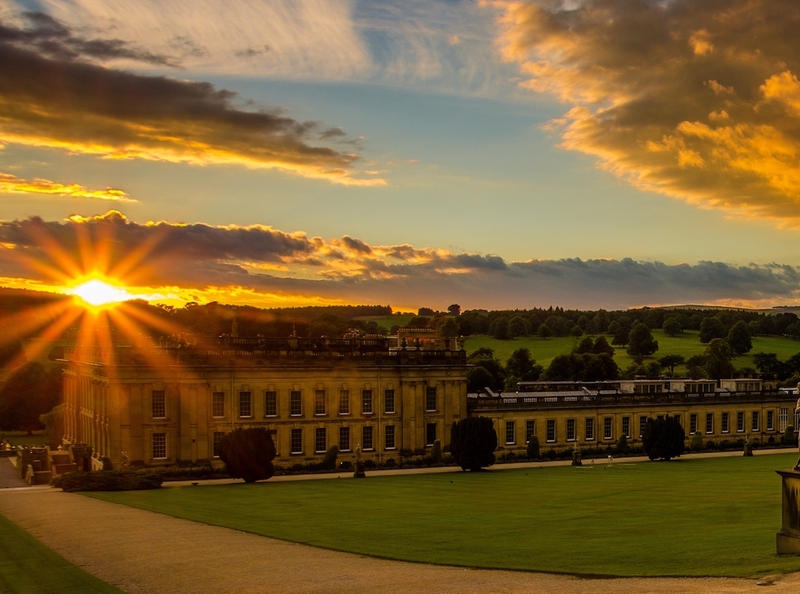 Sunset over Chatsworth House, a 17th century country estate in Derbyshire. 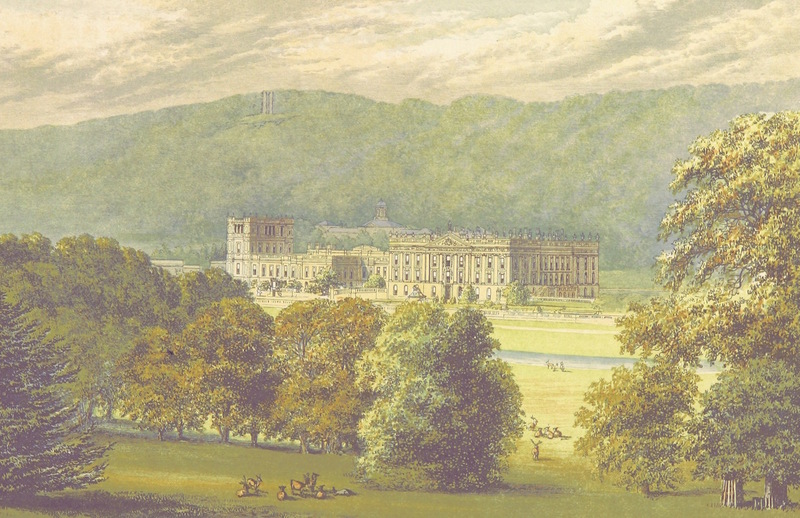 Chatsworth House from the book “The County Seats of the Noblemen and Gentlemen of Great Britain and Ireland”, published year 1866. This 2015 adaptation of Thomas Hardy’s classic novel starred Carey Mulligan as Bathsheba Everdene, a woman who has to choose between three suitors. The novel was set in the fictional county of Wessex, but the majority of filming was done in Dorset, south-west England. 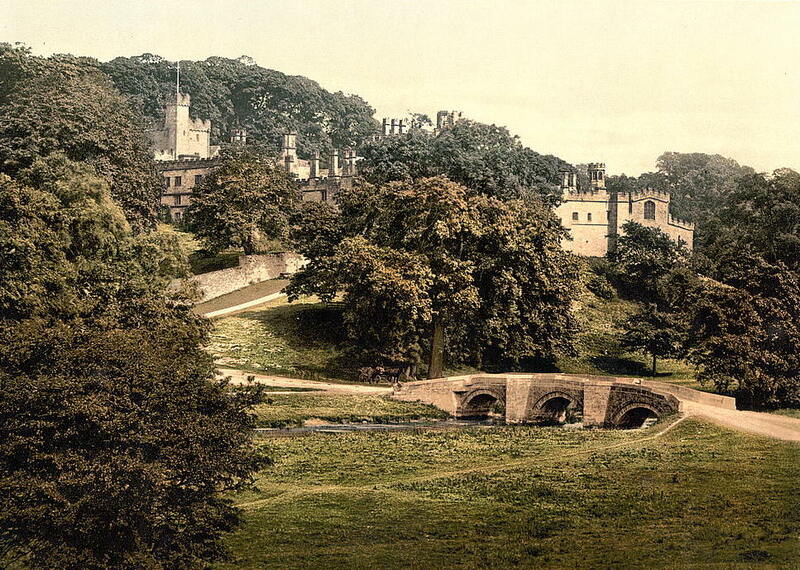 One of the major locations was Mapperton, which doubled as Bathsheba’s family farm. 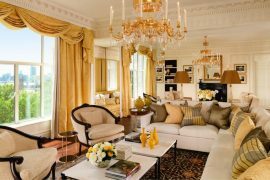 In reality, the sandstone manor house is the home of the Earl and Countess of Sandwich – as well as the building, you can also explore its romantic Italianate valley garden. Next weekend it’s time for their Autumn Plant Fair which takes place on Sunday 17 September. 10am to 4pm. This sale is well established and is now in its 15th year. Another starring role for Keira Knightly saw her portraying Georgiana Cavendish, Duchess of Devonshire, in 2008’s The Duchess. 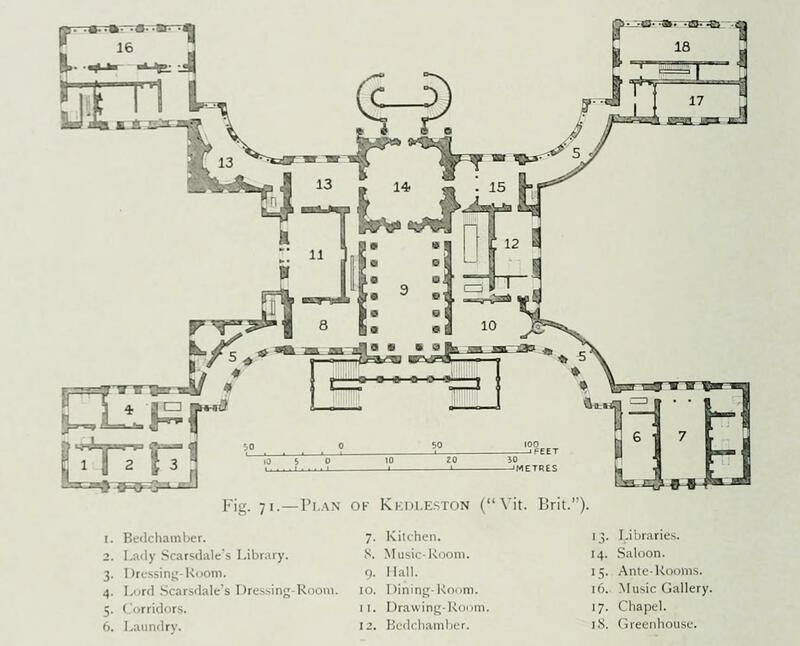 Kedleston Hall, built between 1759 and 1765, and in the Peak District was one of the film’s major shooting locations, standing in for Althorp, Georgiana’s family home. 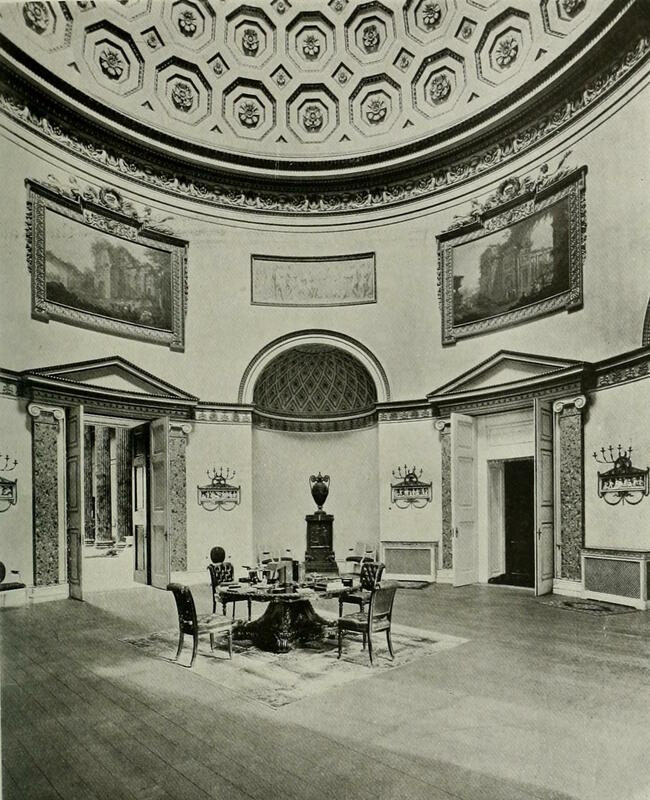 The Marble Hall, Saloon, Library, three State Rooms, the Drawing Room, and the exterior provided the perfect setting for Georgiana’s adventures – you might remember Georgiana flirting with Charles Grey (Dominic Cooper) on the lawn on the house’s South Front before she marries the Duke (Ralph Fiennes). From the book “Robert Adam & his brothers : their lives, work & influence on English architecture, decoration and furniture” from year 1915. A picture from the famous saloon from the same book. 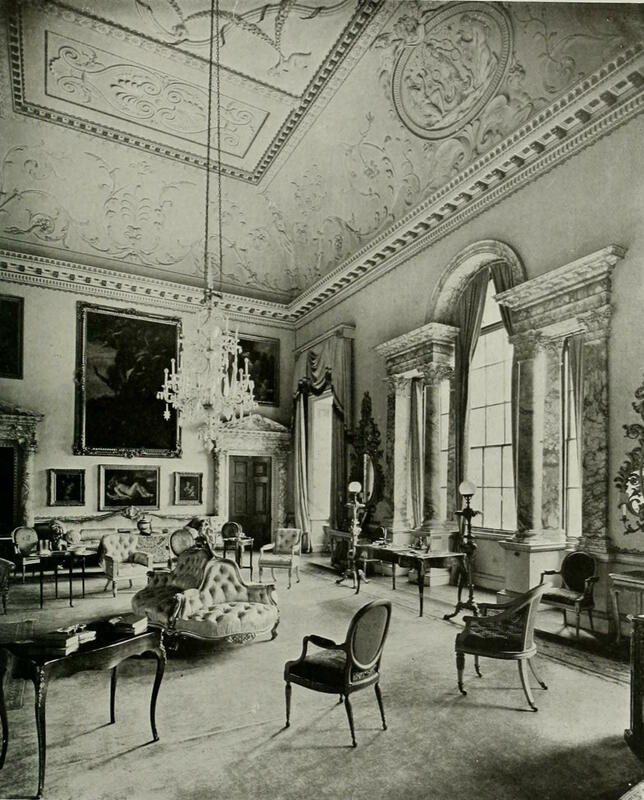 The drawing room the way it looked in 1915. This 1995 Oscar winning adaptation of Jane Austen’s novel was penned by, and starred, Emma Thompson. 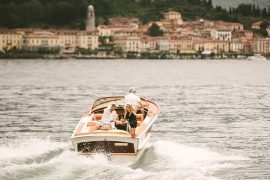 She played the level-headed Elinor Dashwood, with Kate Winslet taking the role of her more impetuous sister Marianne. One of the scene’s most memorable moments is when Marianne, heart broken by the dastardly Willoughby, goes walking in the rain. The formal gardens she walks through belong to Montacute House, which in the film doubles as Cleveland, home to the bickering Palmers (Hugh Laurie and Imelda Staunton). Montacute in Somerset was completed in 1601, and houses a fine art collection – it partners the famous National Portrait Gallery in London. 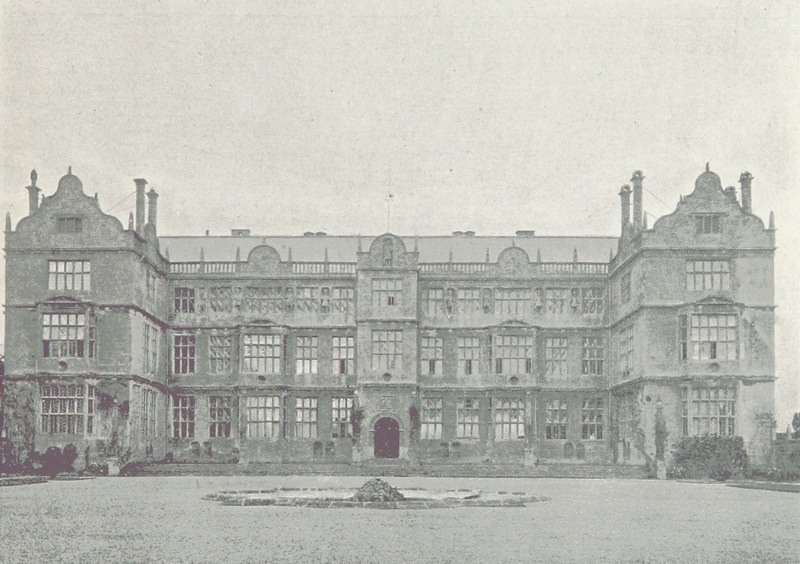 Montacute House from a picture taken year 1898. 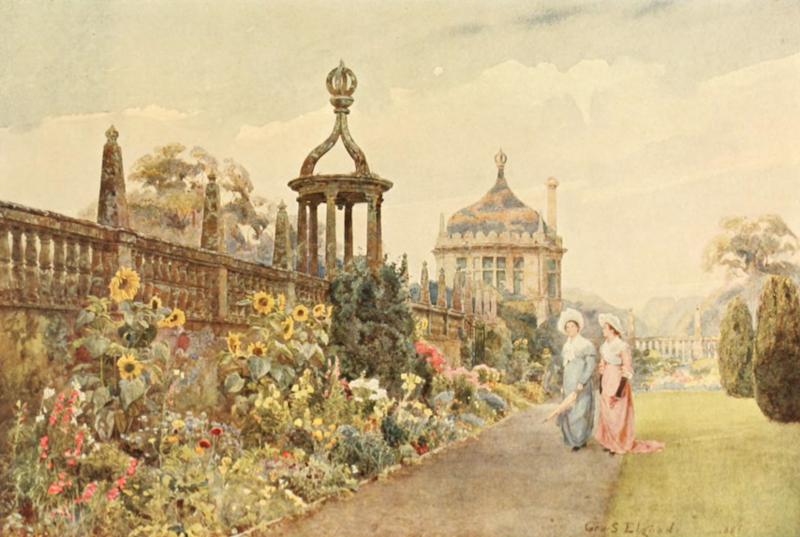 Illustration from the Montacute Garden from the book “Some English gardens” from year 1904. This 1998 romantic comedy saw struggling playwright William Shakespeare (Joseph Fiennes), falling for actress Viola de Lesseps (Gwyneth Paltrow). 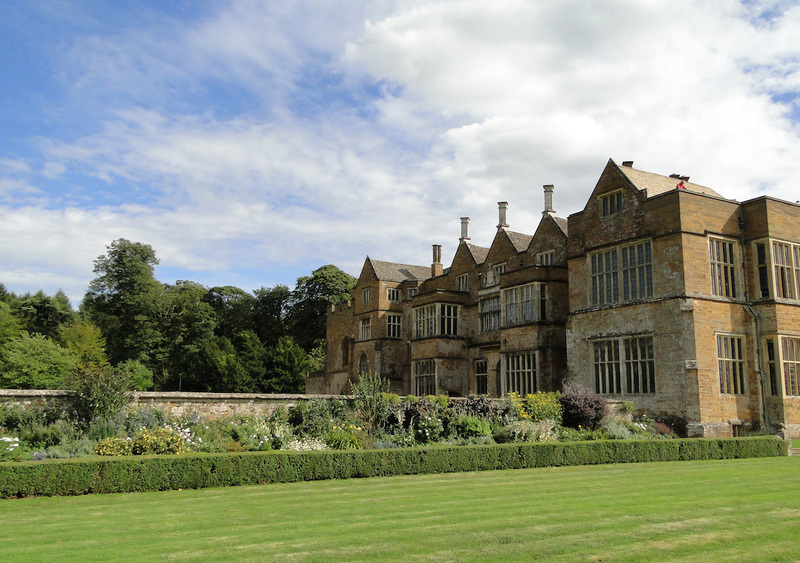 In the film, Shakespeare pursues Viola to her family home, with Broughton Castle in Banbury, Oxfordshire taking the starring role. 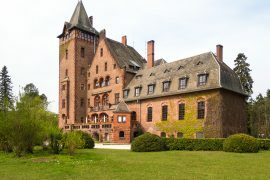 The moated and fortified manor house is currently home to the Lord and Lady Saye and Sele, and has been in the same family since 1447. 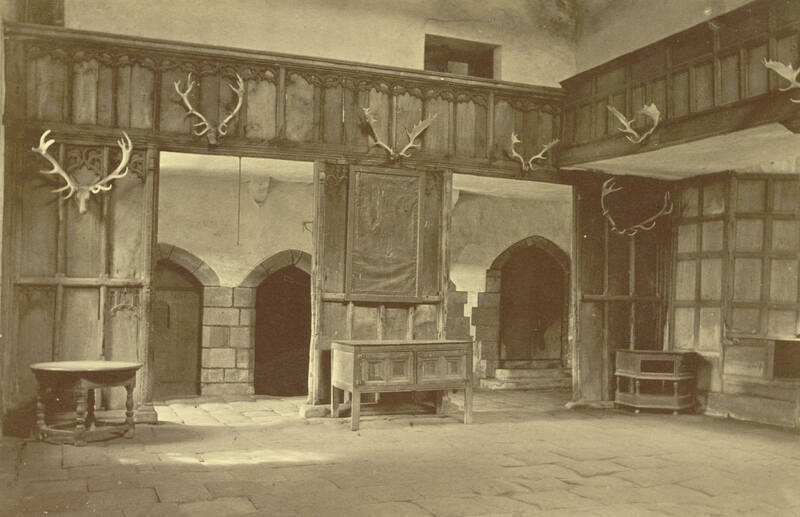 The manor’s Great Hall was used for a pivotal scene where Shakespeare and Viola dance together, while a balcony was added to the side of the building for a scene providing the playwright’s inspiration for Romeo and Juliet. Starring Emily Blunt, this period drama portrayed the early life and reign of Queen Victoria – Britain’s second-longest reigning monarch. 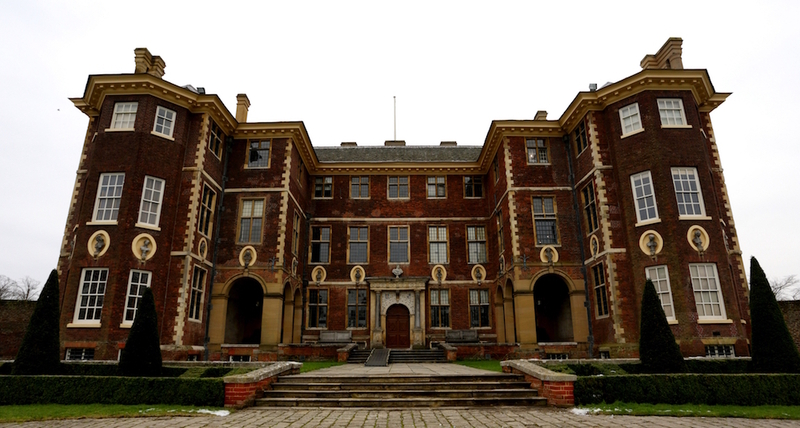 Ham House, a National Trust property that dates back to the 17th century, was used to portray Kensington Palace – the residence where Victoria grew up. You can walk down its Grand Stairs without a servant (as the young queen had to in the film) and along the formal gardens, where Victoria walks with Albert at their first meeting. Don’t forget to explore its dairy with cow-themed furniture, its pharmacy, and the ice house, which would have been filled with ice cut from the Thames during Victoria’s time. This 2011 version of the 1847 novel by Charlotte Bronte sees the titular Jane (Mia Wasikowska) take up the post of governess at Thornfield Hall, where she slowly falls in love with Mr Rochester (Michael Fassbender), only to find he is hiding a terrible secret. 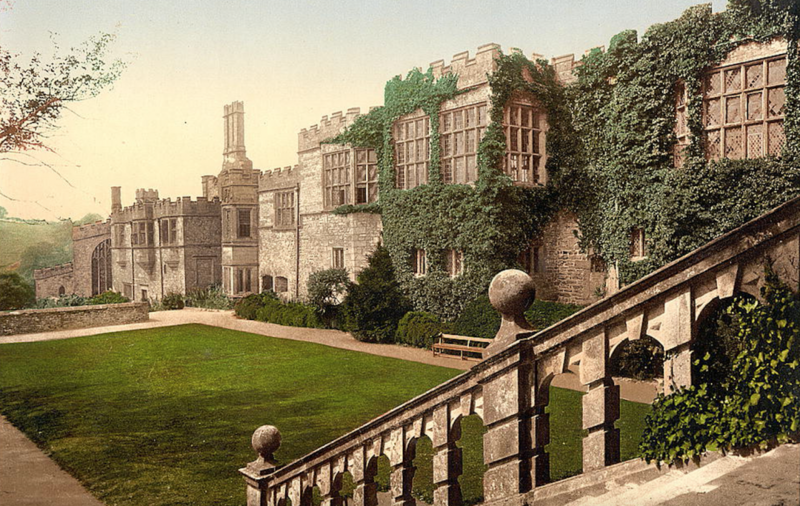 Haddon Hall in Derbyshire took the role of Thornfield – a familiar part as it had already played it twice before. Set in the heart of the Peak District, the fortified medieval manor house was Thornfield in director Franco Zeffirelli’s 1996 film version of Jane Eyre, as well as the BBC’s 2006 mini-series. The film’s end sees Jane returning to Thornfield, only to find it a burnt-out wreck. 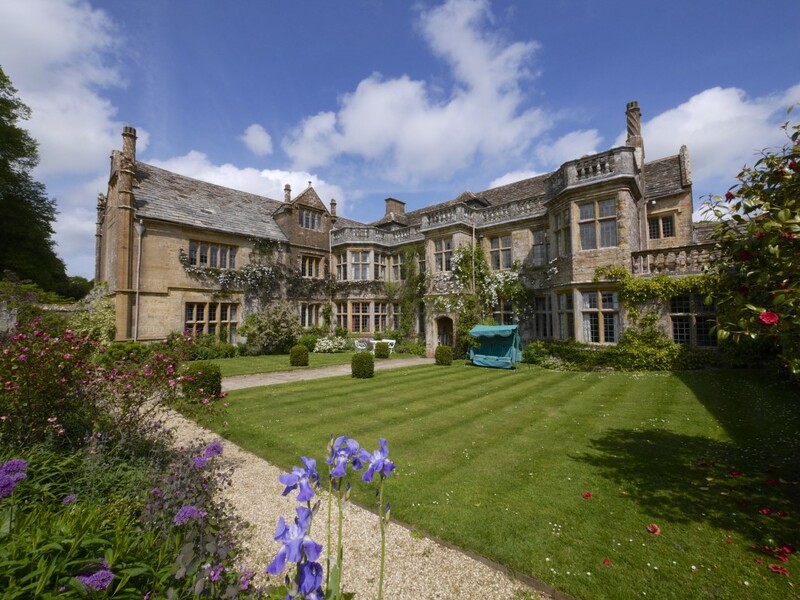 Haddon Hall was spared from the flames, and the crew used the nearby Wingfield Manor instead. The ruined house was once used to imprison Mary, Queen of Scots. 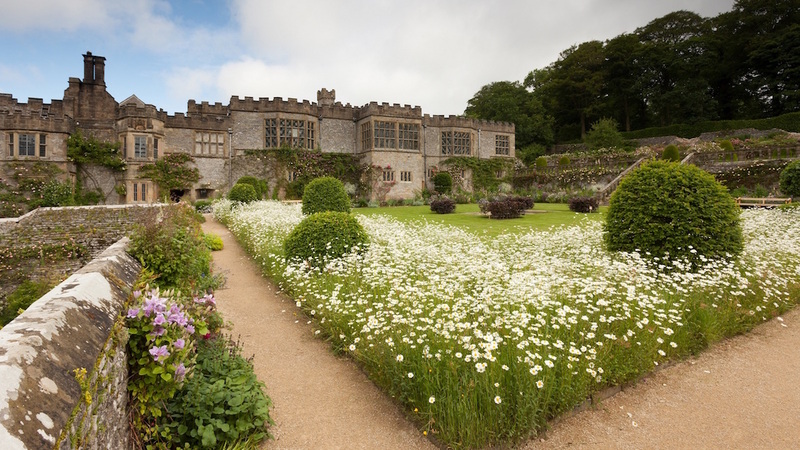 Haddon Hall and Garden. 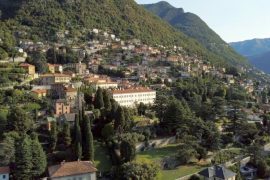 A historic house and formal terraced gardens. 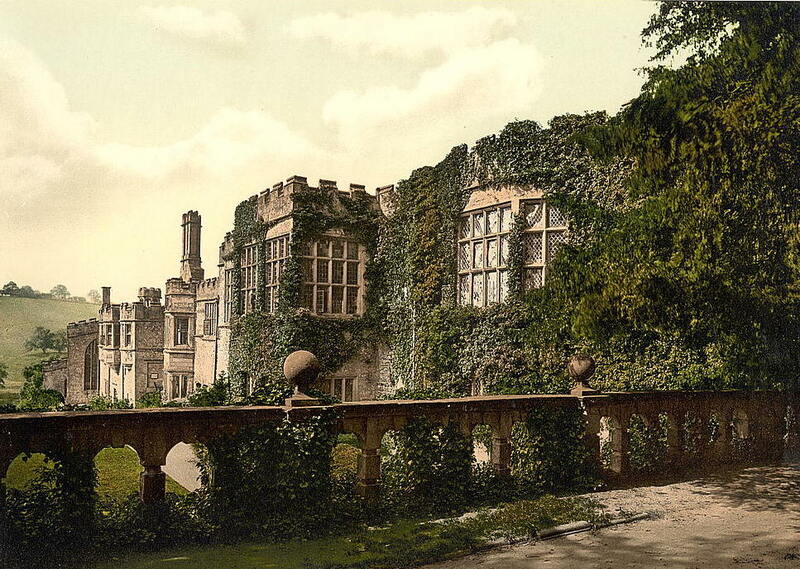 Spectacular views from Haddon Hall in a picture taken between years 1890 and 1900. 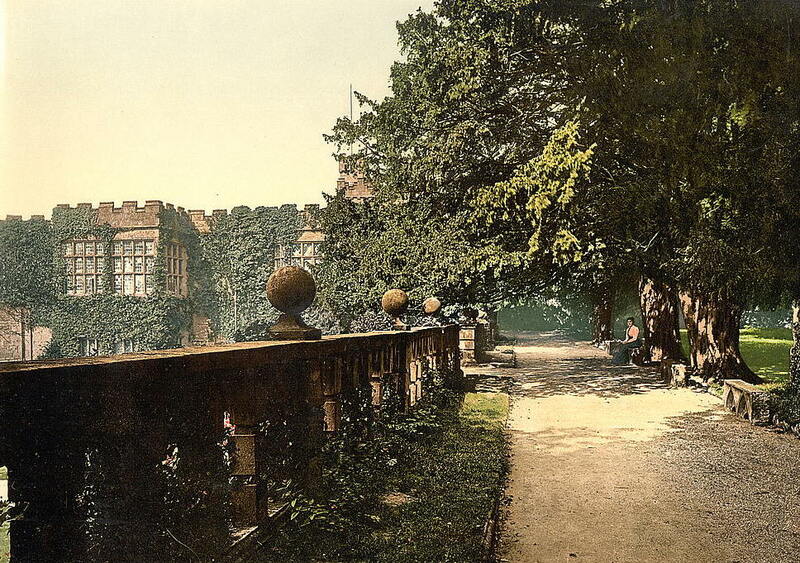 Terrace view from Haddon Hall, from sometimes between 1890 and 1900. 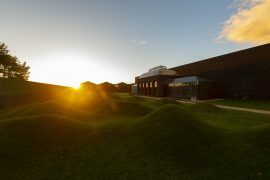 Banqueting hall, picture from ca. 1865-1885.